It was improbable enough when Ben Affleck won a second Academy Award in 2012, following a career slide that included a string of mediocre movies. But few in Hollywood — or in his hometown of Cambridge, for that matter — would have predicted that Ben’s younger brother would also win an Oscar. That’s not because Casey Affleck isn’t talented. He earned a nomination for best supporting actor a decade ago, for his role in “The Assassination of Jesse James by the Coward Robert Ford.” It’s just that the younger Affleck never seemed much interested in a high-wattage Hollywood career like his celebrated sibling’s. 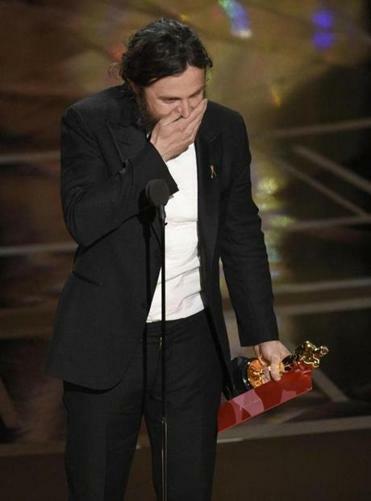 Reached Tuesday in Canada, where he’s directing and acting in an independent movie called “Light of My Life,” Casey Affleck, speaking in a monotone reminiscent of his character in “Manchester by the Sea,” talked about becoming the second member of his family to win an Academy Award. Read: What do they think about ‘Manchester by the Sea’ in Manchester-by-the-Sea? However, not everyone is happy for Casey, who at 41 is three years younger than his brother. In the weeks leading up to Sunday’s ceremony, he was dogged in print and online by claims of sexual harassment stemming from a 2010 lawsuit filed by two women who worked with him on the film “I’m Still Here.” Affleck has denied the allegations, and the suit was ultimately settled out of court, but some observers feel that the Academy’s voters paid too little attention to the controversy. Asked about those sentiments Tuesday, Affleck paused and sighed heavily. He said both sides in the case are prohibited from commenting on the matter, and none of the people who are condemning him online know what happened. Brother Ben, who won the best-picture Oscar for “Argo” in 2012 and shared, with Matt Damon, the Academy Award for best original screenplay for “Good Will Hunting” in 1997, was the first to congratulate Affleck Sunday night, wrapping his arms around him. Gerry Speca, who was the Afflecks’ drama teacher for their four years at Cambridge Rindge & Latin, said there always was a seriousness of purpose about the brothers, and Casey very much looked up to Ben, even then. But they aren’t one and the same. In 2007, Ben, who was by then a bankable movie star, directed his first film — the gritty, Dorchester-based drama “Gone Baby Gone” — and he cast his brother in the lead. The film wasn’t a huge success financially, but it got good reviews and led to higher-profile roles for Casey. “Manchester by the Sea,” written by Kenneth Lonergan, was supposed to be directed by Matt Damon, with another local, John Krasinski, playing the lead. But scheduling conflicts forced Damon out, so Lonergan directed and Casey took over the role of Lee Chandler, a handyman who has to return home after his brother dies. Moore said Affleck has always been discerning about the parts he plays — perhaps too discerning — and the producer doesn’t expect that to change because he has won an Academy Award. Casey acknowledged he hasn’t been in a lot of blockbusters, but it’s not because he’s opposed to making successful movies: “I’ve chosen the parts that have interested me and parts that I thought I could do a job with but also were challenging and a little bit scary. I wish I had more control over my career, but making movies is something you do with lots of people. Mark Shanahan can be reached at mark.shanahan@globe.com. Follow him on Twitter @MarkAShanahan.